Find your home with a career in the home building industry and help others achieve the dream of owning a home. If you like working with wood and take pride in seeing something made with your own hands, then this is the trade for you. 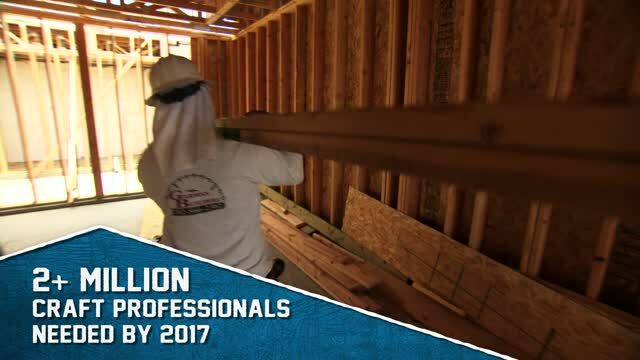 Carpenters are needed in all areas of construction and are often employed through the entire construction process, making it one of the most secure jobs within the industry. Nearly all areas of construction rely on plumbers. If you enjoy working with your hands and using your brain, then this is the trade for you. As long as there are drainage and water systems, there will be a need for reliable plumbers. Install or repair heating, ventilation, and central air conditioning or refrigeration systems, including oil burners, hot-air furnaces and heating stoves. Use your knowledge of green technology to ensure safe and health building conditions in homes, hospitals, schools and office building. Consumers are replacing older, less efficient systems with new green models increasing the demand for HVAC technicians. Whenever a home is built, nearly all of the interior and some of the exterior surfaces need to be painted to protect them from damage by water, mold and corrosion. That's why there is always great demand for experienced painters. Laying brick is one of the oldest and most respected trades in the construction industry. Qualified cement masons are always in demand to place foundations, patios, sidewalks and curbs.